Johann Randall Abrina: We are Champions! 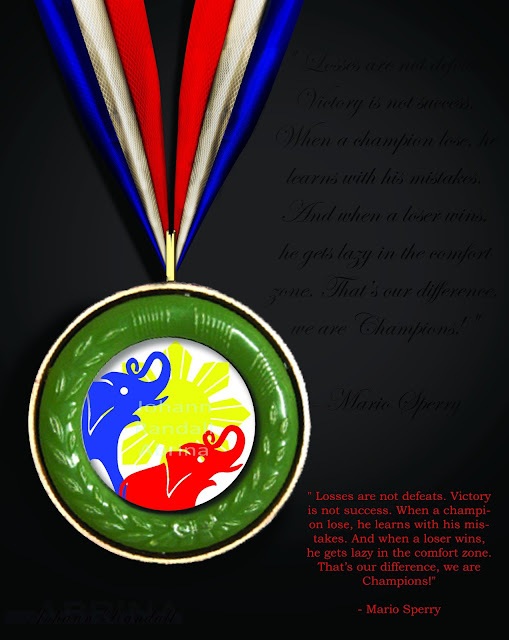 This is an image of a medal for a tarpaulin that I was making for my Memory Training Workshop on Photoshop. I was editing it on a separate file to lower my memory usage since my laptop can't handle huge files. While I was working on it, I had this idea to make it a separate piece altogether, much like a motivation pic that we often see go around on social networking sites. What do you think? How can I make this better? The quote on it was from MMA pioneer Mario Sperry. He was heard saying this while motivating his athletes, The Blackzillians, specifically, Former UFC Light Heavy Champion Rashad Evans. Evans was training to reclaim his title. The way he said it and how his athletes reacted was very moving. It is glimpse on a champion's mindset going into battle, something that we can apply in our lives.